Here’s a bit of zero-sum ignorance: private profits are robbed from consumers; only non-profits or government can deliver full value, or so this logic goes. Those who subscribe to this notion dismiss the function of private incentives in creating value, yet those incentives are responsible for nearly all of the material blessings of modern life. What the government seems to do best, on the other hand, is writing checks. It’s not really clear it does that very well, of course, but it does have the coercive power of taxation required to do so. Capital employed by government is not a “free” input. It bears opportunity costs and incentive costs that are seldom considered by critics of the private sector. The role of private profit and the zero-sum fallacy come up in the context of proposals to privatize government services. In what follows, I discuss a case in point: privatization of Medicare. Rep. Tom Price, the Chairman of the House Budget Committee, is Donald Trump’s nominee to head HHS. In November, Price said Congress would attempt to pass legislation overhauling Medicare in the first year of the Trump Administration. James Capretta of the American Enterprise Institute (AEI) explains some of the features of the possible reforms. Price has supported the concept of a premium support plan whereby seniors would purchase their own coverage from private insurers, paid at least in part by the government (also see here). The Medicare program is beset with problems: it has huge unfunded liabilities; it’s cash flows are being undermined by demographic trends; fraud and bureaucratic waste run rampant; it’s unpopular with doctors; and the regulations imposed on healthcare providers are often misguided. Writing checks to health care providers is really the primary “good” created by the federal government in the administration of Medicare. The Centers for Medicare & Medicaid Services (CMS), a branch of the Department of Health and Human Services (HHS), also performs regulatory functions mandated by legislation, such as the Affordable Care Act (ACA). “…the government’s current payment formulas create perverse economic incentives — to maximize income against the formulas instead of putting patient welfare first. The goal is to change those incentives, so that providers will get paid more if they lower costs and raise quality. After describing several ways in which Medicare regulation, now and prospectively, leads to perverse results, Goodman advances the powerful argument that the market can regulate health care delivery to seniors more effectively than CMS. Wait a minute: profit? But isn’t Medicare a government program, free from the presumed evils of profit-seekers? Well, here’s the thing: almost all of the tasks of managing the provision of Medicare coverage are handled by the private sector under contract with CMS, subject to CMS regulation, of course. That is true even for Part A and Part B benefits, or “original Medicare”, as it’s sometimes called. Under “original” Medicare, private insurers process “fee-for-service” claims and payments, provide call center services, manage clinician enrollment, and perform fraud investigations. Yes, these companies can earn a profit on these services. Unfortunately, CMS regulation probably serves to insulate them from real competition, subverting efficiency goals. Goodman’s suggestion would refocus incentives on providing value to the consumers these insurers must ultimately serve. Then there are “Medigap” or Medicare Supplement policies that cover out-of-pocket costs not covered under Parts A and B. These policies are designed by CMS, but they are sold and managed by private insurers. And I haven’t even mentioned Medicare Parts C and D, which are much more significantly privatized than original Medicare or Medigap. The Part C program, also known as Medicare Advantage, allows retirees to choose from a variety of privately-offered plans as an alternative to traditional Medicare. At a minimum, these plans must cover benefits that are the equivalent to Parts A and B, as judged by CMS, though apparently “equivalency” still allows some of those benefits to be declined in exchange for a rebate on the premium. More optional benefits are available for an additional premium under these plans, including a reduced out-of-pocket maximum, a lower deductible, and reduced copays. Part C has grown dramatically since its introduction in 1996 and now covers 32% of Medicare enrollees. Apparently these choices are quite popular with seniors. So why, then, is privatization such a bogeyman with the left, and with seniors who are cowed by the anti-choice narrative? Not privatized are the following Medicare functions: the collection of payroll-tax contributions of current workers; accounting and reporting functions pertaining to the Trust Fund; decisions surrounding eligibility criteria; the benefit designs and pricing of Part A (hospitalization) and Part B (optional out-patient medical coverage, including drugs administered by a physician); approval of provider plan designs and pricing under Parts C; regulation and oversight of all other aspects of Medicare, including processes managed by private administrative contractors and providers of optional coverage; and regulation of health care providers. The Independent Payment Advisory Board (IPAB) was created under the Affordable Care Act (ACA), aka Obamacare, to achieve Medicare costs savings under certain conditions, beginning in 2015. Its mandate is rather confusing, however, as IPAB is ostensibly restricted by the ACA from meddling with health care coverage and quality. Proposals from IPAB are expected to cover such areas as government negotiation of drug prices under Part D, a Part B formulary, restrictions on the “protected status” of certain drugs, and increasing incentives for diagnostic coding for Part C plans. Note that these steps are confined to optional or already-private parts of Medicare. They are extensions of the administrative and regulatory functions described above. Despite the restrictions on IPAB’s activities under the ACA, these steps would have an impact on coverage and quality, and they mostly involve functions for which market solutions are better-suited than one-size-fits-all regulatory actions. The opportunities for privatization are in 1) creating more choice and flexibility in Parts A and B, or simply migrating them to Parts C and D, along with premium support; 2) eliminating regulatory burdens, including the elimination of IPAB. Privatization is unlikely to have any mandatory impact on current or near-future Medicare beneficiaries. That it might is a scare story circulating on social media (i.e., fake news), but I’m not aware of any privatization proposal that would make mandatory changes affecting anyone older than their mid-50s. Voluntary benefit choices, such as Part C and D plans, would be given more emphasis. There should be an intensive review of the regulatory costs imposed on providers and, in turn, patients. Many providers simply refuse to accept patients with Medicare coverage, and regulation encourages health care delivery to become increasingly concentrated into large organizations, reducing choices and often increasing costs. Lightening the regulatory burden is likely to bring immediate benefits to seniors by improving access to care and allowing providers to be more patient-focused, rather than compliance-focused. 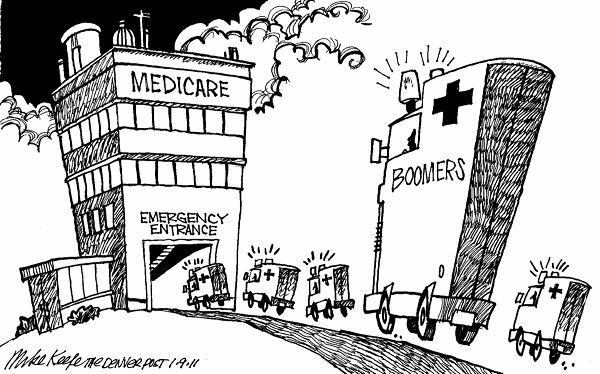 Again, the most heavily privatized parts of Medicare are obviously quite popular with seniors. The benefits are also provided at lower cost, although the government pays the providers of those plans extra subsidies, which may increase their cost to taxpayers. Enrollees should be granted more flexibility through the private market, including choices to limit coverage, even down to catastrophic health events. Consumers should be given at least limited control over the funds used to pay their premia. That would include choice over whether to choose lower premia and put the excess premium support into consumer-controlled Health Saving Account (HSA) contributions. Pricing is a controversial area, but that’s where the terms of mutually beneficial trades are made, and it’s what markets do best. Pricing flexibility for private plans would be beneficial from the standpoint of matching consumer needs with the appropriate level of coverage, especially with fewer regulatory restrictions. Such flexibility need not address risk rating in order to have beneficial effects. Regulations imposed on physicians and other providers should be limited to those demanded by private plans and the networks to which they belong, as well as clear-cut legislative rules and standards of practice imposed by professional licensing boards. The better part of future contributions to the Trust Fund by younger workers (i.e., those not grandfathered into the existing program) should be redirected toward the purchase today of future benefits in retirement, based on actuarial principles. Perhaps the best cost-control reform would be repeal of the tax deductibility of insurance premia on employer-paid insurance plans. This provision of the tax code has already inflated health care costs for all consumers, including seniors, via demand-side pressure, and it has inflated their insurance premia as well. If extended to all consumers, tax deductibility would be less discriminatory toward consumers in the individual market and most seniors, but it would inflate costs all the more, with unevenly distributed effects. Unfortunately, rather than eliminating it entirely, qualification for the tax deduction is very likely to be broadened. The Medicare program is truly in need of an overhaul, but reform proposals, and especially proposals that would put decision-making power into the hands of consumers, are always greeted with reflexive shrieks from sanctimonious worshippers of the state. The most prominent reform under consideration now would offer more of what’s working best in the Medicare program: private choices in coverage and costs. Solving the long-term funding issues will be much easier without a centralized regime that encourages escalating costs. Earning a profit is usually the mark of a job well done. It is compensation for the use of capital and the assumption of risk (i.e., no bailouts). Physicians, nurses, chiropractors, insurance agents and customer service reps all earn compensation for their contributions. Providers of capital should too, including the owners of health insurance companies who do well by their customers. And if you think the absence of profit in the public sector creates value, remember the damage inflicted by taxes. Capital isn’t “free” to society just because it can be confiscated by the government. Hurting the ones you love: one of the Obama Administration’s calling cards is a penchant for misguided economic policy; the change in an overtime rule announced Wednesday by the Department of Labor (DOL) is a classic example. The DOL has amended the rule, which requires payments of time-and-a-half to workers who exceed 40 hours per week, by doubling the threshold at which salaried employees are exempt from overtime to $47,500 annually. This affects almost 5 million workers earning between the old threshold of $23,660 and the new threshold. While the media heralds Obama for “lifting the wages of millions of workers”, those with a grasp of economic reality know that it is a destructive policy. “We might be told that the answer for a startup is simply to ‘go and raise more money.’ But — aside from diluting the founders who are paying for the company with their sweat in exchange for the hope of a payoff that comes in years, if ever — raising capital is the single most difficult thing I do as a startup entrepreneur. I would invite anyone not in our field to give it a shot before he endorses a regulation that will impose greater capital costs on us. Shutting down, or not starting up, is a bad outcome, but that will be a consequence in some cases. However, there are other margins along which employers might respond. First, a lucky few well-placed managers might be rewarded with a small salary bump to lift them above the new exemption threshold. More likely, employers will reduce the base salaries of employees to accommodate the added overtime costs, leaving total compensation roughly unchanged. Many other salaried employees with pay falling between the old and new thresholds are likely to lose their salaried status. Their new hourly wage might be discounted to allow them to work the hours to which they’re accustomed, as demotivating as that sounds. If their employers limit their hours, it is possible that a few extra workers could be hired to fill the gap. Perhaps that is what the administration hopes when it claims that an objective of the new rule is to create jobs. Unfortunately, those few lucky hires will owe their jobs to the forced sacrifice of hours by existing employees. Terry Shea, co-owner of two Wrapsody gift shops in Alabama, would prefer to keep her store managers exempt from the overtime-pay requirement as they are now. But raising their salaries above the new threshold to ensure that would be too big of a jump for those jobs in her region, she said. Instead, she’ll convert the managers to hourly employees and try to limit their weekly hours to as close to 40 as possible. She’ll also have to stop giving them a comp day when their weekly hours exceed 46, a benefit she said they like as working moms. Here is some other reading on the rule change: Nick Gillespie in Reason agrees that it’s a bad idea. Andy Puzder in Forbes weighs in on the negative consequences for workers. John Cochrane explores the simple economic implications of mandated wage increases, of which the overtime rule is an example. As he shows, only when the demand for labor hours is perfectly insensitive to wages can a mandated wage avoid reducing labor input. This is another classic example of progressive good intentions gone awry. Government is singularly incapable of managing the private economy to good effect via rules and regulations. Private businesses hire employees to meet their needs in serving customers. The private compensation arrangements they make are mutually beneficial to businesses and their employees and are able to accommodate a variety of unique employee life-circumstances. Good employees are rewarded with additional compensation and more responsibility. By and large, salaried workers like being salaried! Hard work pays off, but the Obama Administration seems to view that simple, market truism as a defect. Please, don’t try to help too much! An analysis by the Economic Policy Institute (EPI) is the basis for breathless claims by the Left that a substantial increase in the minimum wage would have “sweeping benefits for low-income families.” The EPI study purports to show that spending on public assistance will decline significantly with the increase in the minimum wage. Author David Cooper’s analysis is purely static, dressed up with a few linear regression equations relating participation in federal welfare programs to the wage distribution. However, his conclusion is preordained by the very design of the analysis, which relies on pooled data from public assistance programs across 2012 – 2014. This was a period over which wages were generally rising, but the federal minimum wage was constant (and only a few state minimum wages were increased). It’s no surprise that higher wages are associated with a reduced likelihood of receiving needs-based public assistance in a cross section. That’s not quite the same as measuring the dynamic impact of an increase in the minimum wage. The adjustment to a higher wage floor involves more complex shifts in the structure of the economy, including higher prices, a higher incidence of small business failure and the substitution of automated systems for labor. And celebration would not be in order if the policy change prompted a deterioration in the employment prospects of the least-skilled workers, and it would. There are a few gaping holes in the EPI analysis. One involves a data limitation whereby the distribution of public assistance by wage decile is related to individual workers or their families. It is one thing to say that most recipients of public assistance work for a living. It is quite another to say “Most recipients of public assistance work or have a family member who works.” Obviously, the latter does not imply the former, yet the analysis asks you to accept that the wage rates of family members who perform work during a year are the determining factor in welfare program participation, rather than the employment status and hours of all members of the household. The analysis includes cross-sectional regressions relating the receipt of public assistance (yes or no) to wages imputed at the individual level, controlling for a complex function of age (polynomial terms), other demographic factors and part-time work status during the previous year. As stated above, the data are plagued by measurement issues. Furthermore (and this is a technical critique), linear regression is not an appropriate statistical methodology with a binary dependent variable. The author should have known better, but we’ll leave that aside. Controlling for part-time status is intended to create a more reliable estimate of the effect of wages on program participation, as part-timers are more likely to earn low wage rates. But if hours matter in that way, then the regression is all the more suspect because hours of work are otherwise ignored (except in the imputation of wage rates). The truth is that poverty is not a wage problem as much as a jobs and hours problem. A recent post by Angela Rachidi of the American Enterprise Institute notes that “Only 11.7% of poor working-age adults worked full-time for the entire year in 2014.” Impoverished individuals who work full or part-time are concentrated in low-skilled occupations. Those are likely to be the same kinds of jobs for which impoverished non-workers might otherwise compete. Many of those jobs are at or near the minimum wage, but increasing the wage floor will only exacerbate the problem of unemployment or underemployment. An increase in the minimum wage might help those workers who are able to keep their jobs. Unfortunately, if they remain employed, they are likely to suffer non-wage repercussions at their jobs. Therefore, the size of the net economic gain for those lucky enough to keep their jobs is open to question, though their measured income will rise. Still, keeping your job may be a big challenge. The EPI analysis pays no heed to the negative employment effects of changes in the minimum wage. These stem from employers’ efforts to control costs, hiring only when the skills and expected productivity of a worker exceed the cost. Growth and job opportunities are thus quashed by the intervention, including the gain in skills that comes with experience. If a business hikes price to defray higher labor costs, the negative impact on customers will induce them to buy less, reducing the need for labor. Another possible impact may be caused by the so-called “welfare cliff“, or the tendency of many program benefits to decline as income rises, which imposes a marginal tax rate on beneficiaries’ labor income. A higher wage floor might induce a worker to reduce hours to avoid the cliff, if their employer allows it, or it might induce another employed member of the same household to reduce hours. Other recent work shows that minimum wage increases during the Great Recession increased unemployment among workers age 16 – 30 with less than a high-school education. Another paper finds that minimum wage hikes are bad anti-poverty measures, poorly targeted and regressive in their effects on the poor due to higher prices. A couple of previous posts on Sacred Cow Chips include many links to other work on minimum wages: “Major Mistake: The Minimum Opportunity Wage“, and “Unintended Consequences: Living (Without a) Wage“. Today, many jobs are at risk of automation, so the responsiveness of employers might be greater than ever. In a strong sense, EPI’s findings and conclusion are beside the point for the many low-skilled workers whose jobs would be at risk, as well as those who might never be given legitimate employment opportunities under a higher wage floor. Those erstwhile workers and job seekers are generally the least skilled and most in need of experience. But EPI, and unthinking living wage advocates, are all too eager to signal the humanity and virtue of their favored policies, foolishly ignoring the negative and inhumane employment consequences.